NAAM - Dutch Meal: Stamppotten! Imagine: all kinds of Dutch Stamppotten dishes together and you get to choose one or all? Well, that is going to happen on Sunday, March 23rd, from 1 - 3 pm at the Danish-American Center in Minneapolis! Stamppot (English: Mash Pot) is a traditional Dutch dish made from a combination of potatoes mashed with one or several other vegetables, sometimes also with bacon. These vegetable pairings traditionally include sauerkraut, endive, kale, spinach, turnip greens, or carrot and onion (the combination of the latter two is known as hutspot in the Netherlands and as wortelstoemp in Belgium). 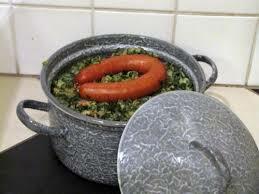 It is usually served with sausage (in the Netherlands often smoked, in Belgium more often fried) or stewed meat. This event will only be possible if we all contribute and make a dish that can be shared. Below, some ideas for stamppotten are listed, as well as some referral websites. To avoid that we all make the same dish, please mention in your rsvp whether you will be making a stamppot, which one and if it's vegetarian or not. Please make sure that the dish is prepared at home and heated before you leave to go to the DAC. We have possibilities for re-heating, but heating space is very limited. This event will take place at the Danish American Center in Minneapolis from 1 - 3 pm and starts after Boekenwurm Nederlandse school. This event is free for NAAM members, $4 for non-members. Drinks will be provided by NAAM.